It seems like pretty much all our electronics projects take some kind of batteries. At some point most people wonder if they should use the regular alkaline batteries or switch to rechargeables. The sooner you evaluate your situation and make a choice the better. Many of you will be making this decision for a school environment, because of this the weight you give the various pros and cons could be significantly different that what you would choose just for yourself. The cost of charging a rechargeable battery is something like .01 cent for 5 charges. Recharges are practically free. 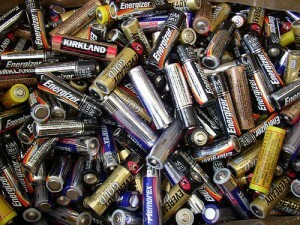 There are a few other things you might want to know about alkaline and rechargeable batteries. Alkaline and rechargeable batteries, AA for example, don’t have the exact same voltage. Regular AA batteries typically have 1.5v when they are new, rechargeables typically have 1.2v when they are freshly charged. This difference isn’t usually significant for most projects. Standard AA batteries start out with a higher voltage but it drops as the battery drains. 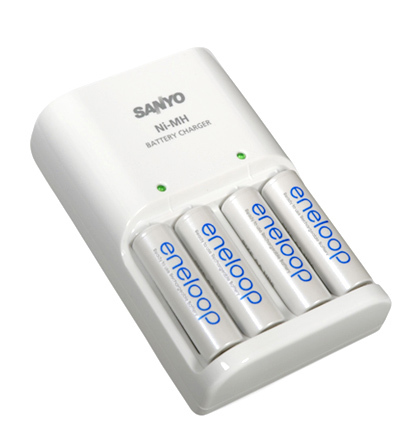 The rechargeables tend to hold their voltage more constant. In addition to volts, batteries are measured by mAh (milliampere-hour) there can be wide fluctuations of mAh capabilities of batteries. AA batteries can be rated from 500mAh to over 3000mAh. This is often the biggest difference between a cheep and expensive battery. Technology for both types of batteries is always advancing but in general the average alkaline batteries will have a higher mAh rating than the average rechargeable. Of course there are exceptions and the mAh will drop quicker on an alkaline battery than a rechargeable battery as they drain. An alkaline battery could actually last longer in a low draw situation like a smoke alarm, but in a high drain situation like a camera a good rechargeable will last 3-4 times longer than a good alkaline. How many cells does it hold. This may seem obvious but think about how you will recharge your batteries. Will you have enough that you can put the dead ones in a box and recharge them when you think of it or will you need those same batteries the next day? Some chargers can only charge batteries in pairs so you always have to have an even number, others can charge batteries one at a time so in a 4 cell charger you can charge 1,2,3 or 4 cells at a time. There are no standards for a “fast charger”, a good charger will charge 1 or all of it’s AA cells in around 7 hours, other chargers will take closer to 11 hours. It’s OK to leave your batteries in the charger after they have finished charging for a day or so but it’s best not to leave them for longer because they will discharge a little then go into charge mode – rinse and repeat. Chargers have “smarts” built into them to charge the right amount for the right time and know when to shut off. Fancy ones will have displays showing stats about the batteries. It’s seldom a good idea to buy the cheapest one. The extra features of the expensive ones may or may not be worth it to you. I have found the reviews on Amazon very helpful for picking out a charger for my needs. When you have the right batteries you hardly think about them. When you have the wrong batteries they can be the proverbial thorn in your side. Here are some other resources to help you.